It’s a bird. It’s a plane. It’s a specialty coffee shop in a semi-industrial estate in Noosa. Tucked into the back corner of a pretty well stocked deli, Clandestino is as undercover as a cafe can be while not truly being undercover – they’ve got a growing reputation amongst people who love coffee. And it’s deserved. They’ve put a fair bit of effort into the little things – and – the bigger things, with this life sized plane flying over the bar area. It’s a fantastic atmosphere – and if it wasn’t so cliched, I’d compare it to something you might find in Melbourne. It’s like nothing I’ve ever been to before – and the relationship with the deli makes it a knock out spot to spend a few lazy hours sipping and reading while you’re on a Sunshine Coast stopover. They’ve also paid attention to their coffees – four grinders on the bench next to a rich, orange, La Marzocco, are stocked with rotating single origins, a seasonal blend, and, if you’re into that thing – decaf. My first coffee was a Costa Rican Don Jose Micromill, a honey processed bean that was, as the tasting notes promised, full of cherry and chocolate notes. My second was on their seasonal blend – which was a little bitter up front, but had a really nice finish and a lingering, sweet, aftertaste. There are specialty coffee knick knacks, and shiny machines, all over the place – there’s a nice little brew bar, featuring a variety of pourover, clover, or siphon coffee, and a couple of cold drips sitting on the counter. They roast in house – right behind the bench. And the place oozes with atmosphere. The vintage teaspoons are another nice touch. 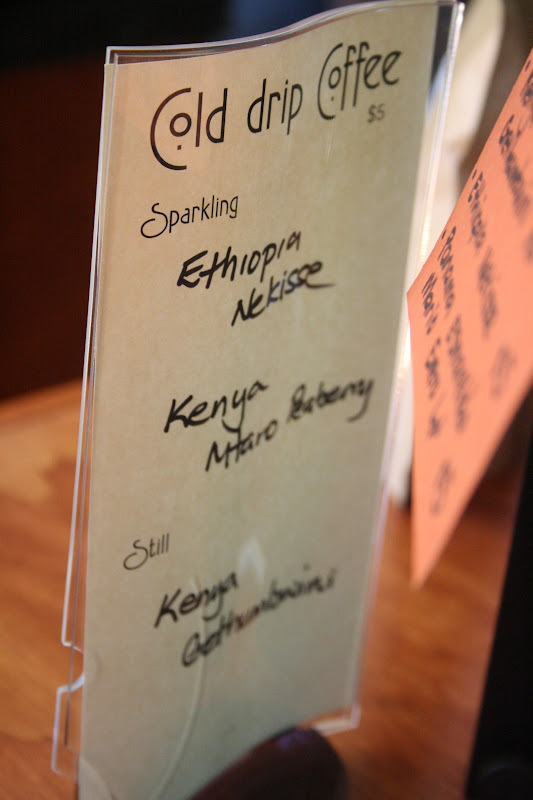 It seems they’re pretty committed to educating the consumer – the tasting notes that are standard fare for good cafes these days, are supported by a huge map of the globe, marking the origins of the beans they source, and they offer cupping courses on site, but will also take them on the road for corporate events. Their beans are available for retail – and they wholesale, at least to another Noosa Cafe, Cafe La Monde. There’s food available from the deli – and you pay for anything you consume when you exit, so you could potentially spend all day, and get three square meals, in the comfortably appointed cafe area. Coffee Alchemy is closed on Sundays. This is very important information. Important information that I forgot to look up before walking the 1.4km from where we were staying, desperately seeking caffeine, on Sunday morning. They also don’t do food. It’s a coffee bar. Attached to a roastery. What they do do is mighty fine coffee. 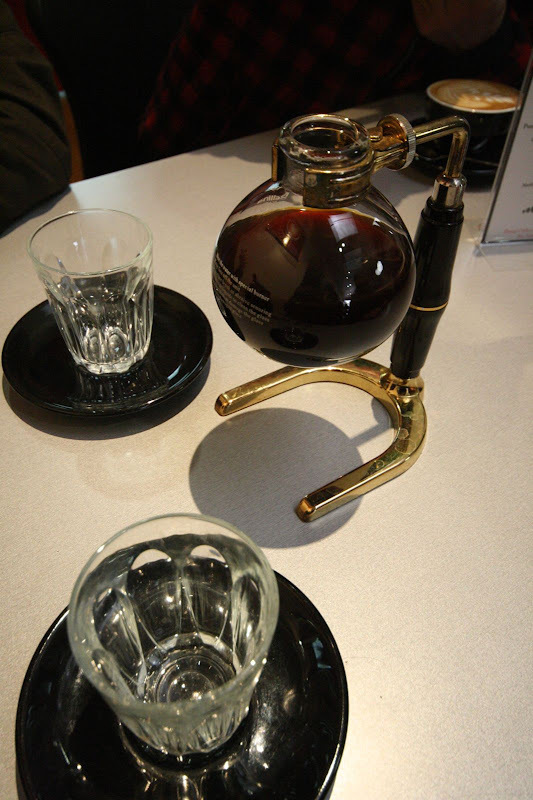 I counted 10 different single origin coffee varieties on offer, as espresso (with or without milk), cold drip (with or without sparkling mineral water), and pourover. And there were blends. None in the hopper today, but plenty available to take home. A beautiful La Marzocco machine. Very shiny. Is the first thing that catches the eye on the way in the door. 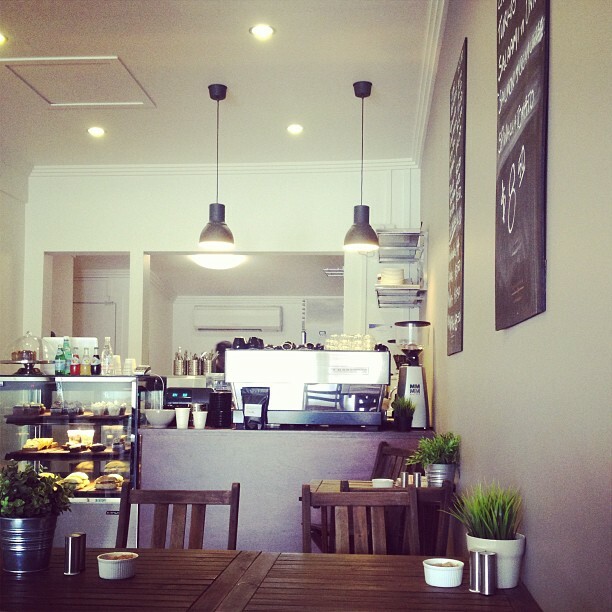 The fitout is elegant, and simple, and lets you know this is a place where the focus is on the coffee. And the focus pays off. First up was the double shot flat white on the Brasil Canta Galo. Delicious up front, it was incredibly chocolaty and smooth with an odd aftertaste. One of the tasting notes at Bean Drinking yesterday suggested “leather” was a possible taste – and I’d say this was the closest thing to leather I’ve tasted short of chewing on a belt. It wasn’t unpleasant. That’s just the only description I can come up with. And it was only in the aftertaste, which pretty quickly disappeared. My wife had a picolo on a Bolivia Caranavi Eleuteria Villca. In milk some of its acidity was lost and in its place was a smooth, thick, deliciously balanced drop with a hint of nuttiness. It’s at times like this that I start to question whether I should be tasting coffee in milk, because the milk masks some of the different flavours. And I finished my trip off with a Tanzanian Blackburn Estate “Pick of the Harvest”, as a picolo – the same I enjoyed yesterday as a sparkling cold press at Bean Drinking. This bean packs a punch. It was earthy up front, with a touch of caramel, or maybe even burnt sugar, and then, as I sat savouring the aftertaste – a hint of strong red wine, or port, or something. It was fruity, but very fleeting. These guys take their coffee seriously and it reaps benefits. I’d go there again in an instant. 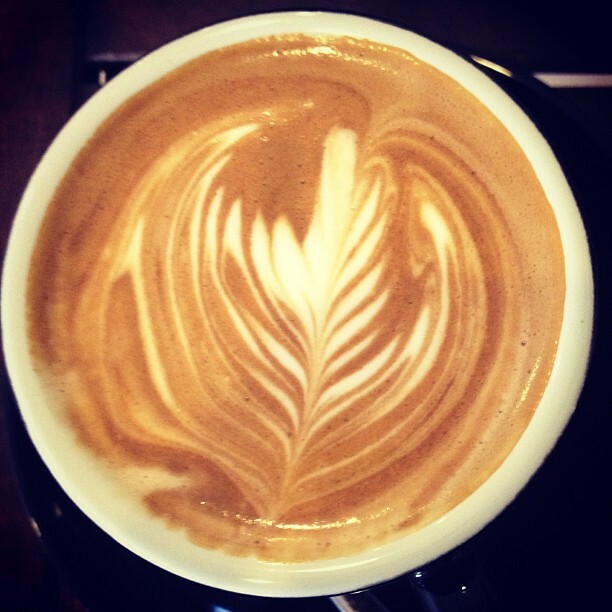 You can follow Coffee Alchemy on Twitter.